The City of Portland is planning to plant some trees along the park blocks on 72nd Avenue between Beech and Failing. Would you like to help out? Click here and sign up! 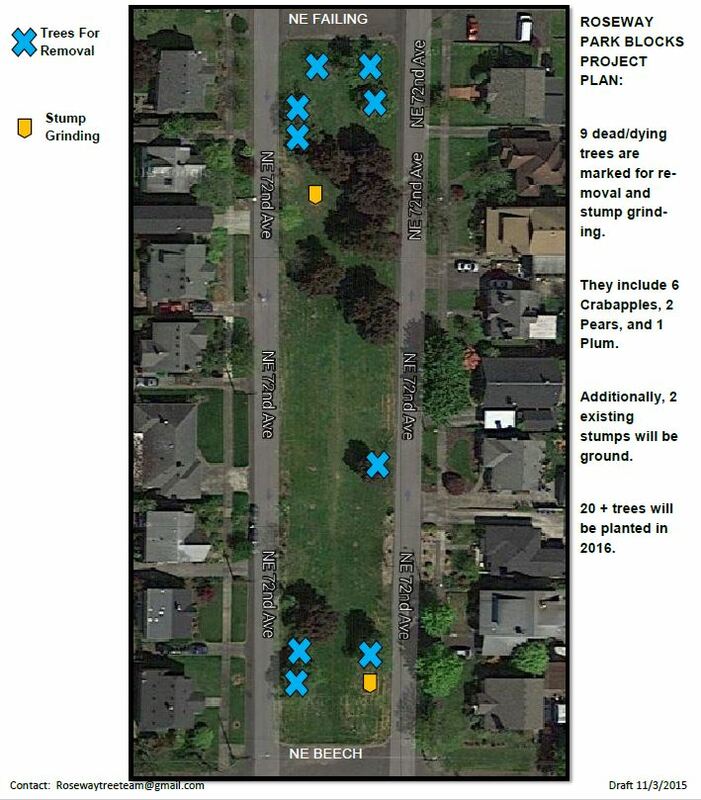 A tree planting adventure has been scheduled by the city on March 12th in the 72nd Avenue park blocks between Failing and Beech. Below are the plans for removal and replanting. Some of the trees in the park blocks are at the end of their lifespan and have become dangerous. You may have noticed how easily some have fallen in recent storms. So, as some trees must be removed, others will be taking their place. New Trees Coming to Park Blocks! Roseway planting Feb. 14th will continue to beautify park blocks. Event time:Â Â 9am-11:30am. Urban Forestry is adding to the romance of Rosewayâ€™s 72nd Avenue park blocks with a Valentineâ€™s Day tree planting. The planting will help the Roseway Neighborhood Association complete Phase One of a decade-long effort to rejuvenate and beautify the four blocks. Â Some 19 trees purchased with money from the Cityâ€™s Tree Planting and Preservation Fund will help fill gaps in a massive planting done back in 2003. That earlier planting was needed because row after row of identical clones of Thundercloud plum planted by civic boosters back in the 1950s were dying out. One of the drawbacks of that uniform planting of a single clone of plum is that all the trees die after about 50 years. Neighborhood resident Sean Batty envisioned replacing the monoculture on 72nd Avenue with different species of longer-lived trees, namely chestnuts, oaks and hackberries. 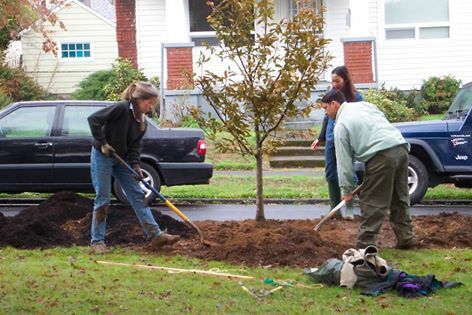 Supported by the City of Portland and Chad Honl from Friends of Trees, some 80 trees were planted on Nov. 15, 2003. About 75% of those trees survived to become established and are well on their way to becoming magnificent shade trees. The new planting is to fill gaps in the perimeter left by trees that were hit by cars or didnâ€™t survive for one reason or another. 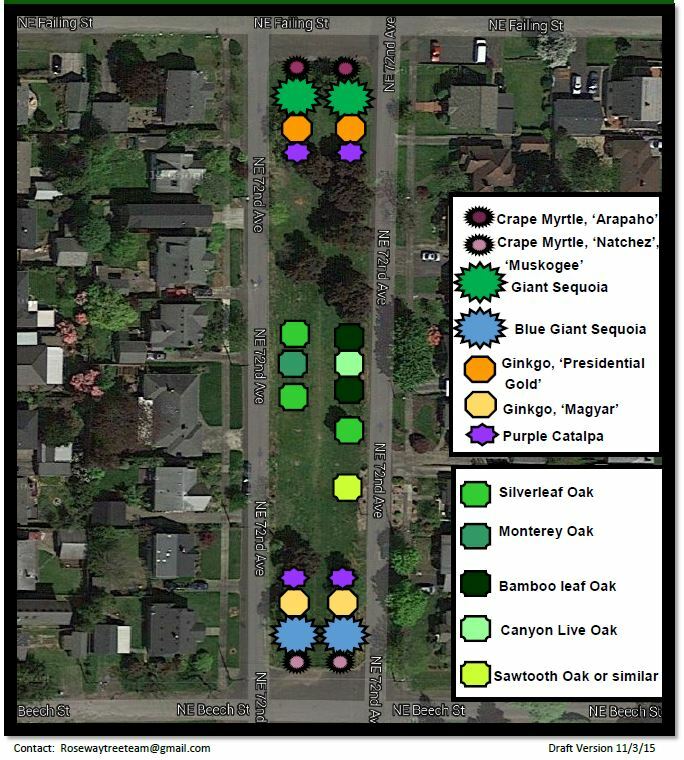 Because chestnuts and oaks have thrived in the park blocks, the new planting will showcase additional members of Fagaceae, a great family of 600 species that contains oaks, chestnuts and beeches among others. Not only will that add to the botanical education value of the blocks, but the new beeches, oaks and chestnuts will become large trees.Â With potential lifespans well over a century, these treesâ€™ spreading canopies will also provide Roseway with significant summer shade, cooling the air on hot summer days, absorbing road noise from nearby Sandy Boulevard , and prolonging the life of street pavement. Batty has said of Phase One that â€œâ€¦the project demonstrates how citizens and bureau can work together to achieve great results.â€Â He already envisions a future Phase 2 that at each end of each block will combine the vibrant fall color of ginkgos and katsuras with spring-flowering trees set off by evergreen sequoias. The result will create a majestic local legacy for Roseway residents well into the next century. For more information contact Portland Parks & Recreation Urban Forestry at 503-823-8779 or karl.dawson@portlandoreogn.gov. To sign up to help with the planting click here. prune 80 young trees along NE 72nd Avenue from Sandy to Prescott Street. for safety, low branches and structure. full two hours, or as long as you can. If you have any questions about your street trees, please call Portland Parks & Recreation City Nature for a street tree inspection at 503-823-4489. City tree inspectors are available to assess your street trees, and issue pruning, planting or tree removal permits.